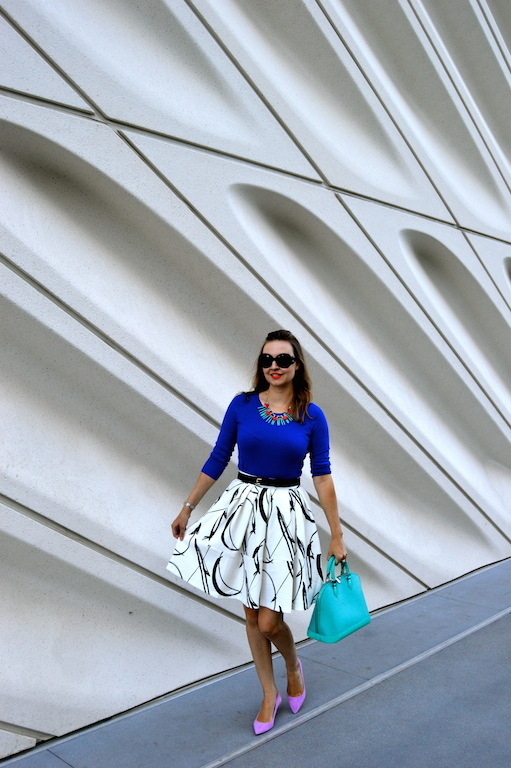 Yesterday my husband and I went to the newly opened Broad Museum in Downtown Los Angeles. In the photos below I'm standing in front of the facade of the museum. If you haven't seen an image of The Broad, it's basically this gigantic box draped in concrete that has a net-like appearance, which is really just a shell for the building. Oh, and there's a gigantic oculus in the middle of the building on one side. This week I plan to put together a post on the museum both with a few images of its exterior and the contemporary art that can be found in the museum's interior. I decided to drape myself in something equally visually stunning for my visit to the museum, which just happened to be this skirt from Banana Republic. The skirt appears to have scribbles on it, or some very wild cursive handwriting. The scribbles are actually X's and O's, hugs and kisses. It actually matched a Cy Twombly painting we saw at the museum just perfectly. So the writing wasn't just on my skirt, but also on the wall! Great outfit! And prefect for the occasion! I love the skirt! And the bag, and the necklace. The shoes. Everything! love the pink shoes! beautiful bold outfit! 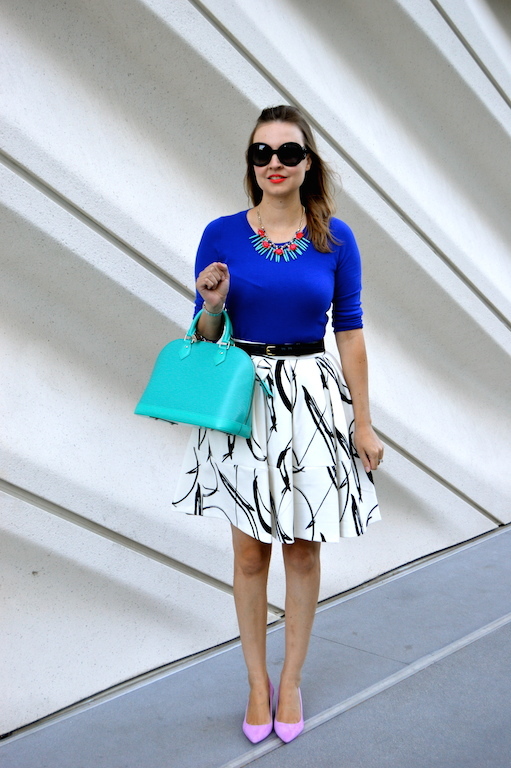 Outings to the museum definitely call for a fashion-forward, artsy look! That skirt is fab! Oh my that skirt is wonderful! And you're so good at putting colours together. 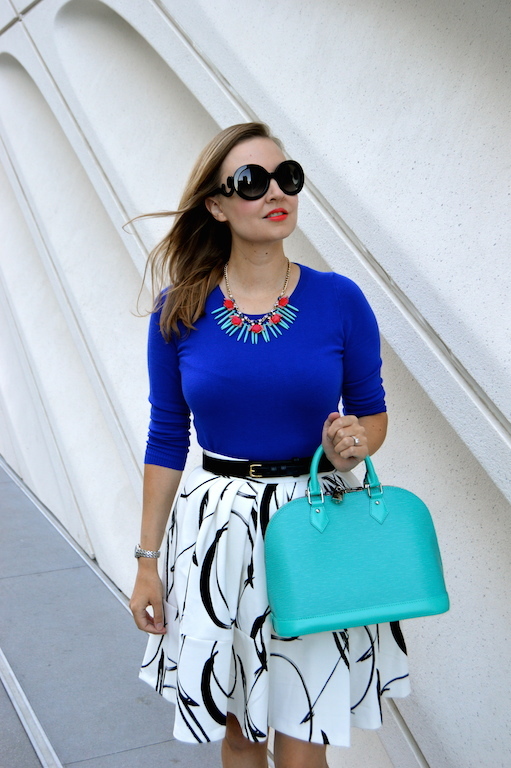 The pops of turquoise and blue are beautiful against the black and white skirt. I love museums so looking forward to your post about it.